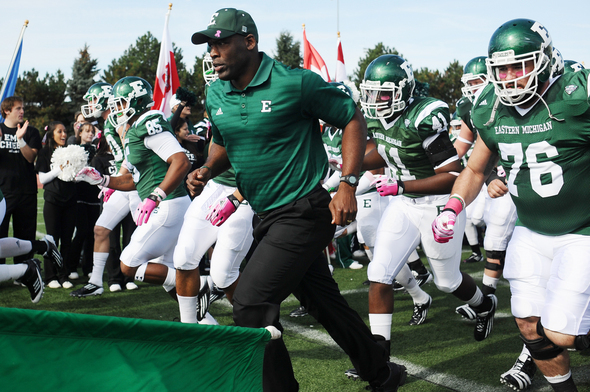 Ready for some bowl talk for the Eastern Michigan football team? Posted on Tue, Oct 25, 2011 : 5:25 p.m.
Ron English and the Eastern Michigan football team are on a two-game winning streak and in contention for a bowl bid. The Eastern Michigan football team is 5-3 and two victories from being eligible to accept a bowl bid. The college football prognosticators at Rivals.com believe it will happen. Eastern, it notes in its latest bowl projection article, has been to just one bowl in its history (1987). For now, Rivals.com has the Eagles making it to the New Mexico Bowl against Wyoming. That's a 2 p.m. game on Dec. 17 (ESPN) if you're already setting up recorder. The Eagles have won two consecutive games and are off this week before consecutive home games against Ball State and Buffalo. Eastern is 4-0 at home this season. Wed, Oct 26, 2011 : 4:04 p.m. It is good to see a Michigan man as coach of EMU turning things around. Expect improved game performance and better recruits now that the SHERIFF has come to clean up the mess. The MAC will never be the same. Wed, Oct 26, 2011 : 5:38 p.m.
&quot;Michigan Man&quot;??? Like most college coaches English has worked at many schools. Why not call him a Louisville Man, Arizona State Man, etc? He attended Cal so he'd probably prefer to be called a Cal Man. Not to crush the ego of UM fans but just because a guy works for UM does not mean he bleeds maize and blue blood. Wed, Oct 26, 2011 : 4:42 p.m.
A &quot;Michigan man&quot;? What's that got to do with it? As in former basketball coach Charles Ramsey? &quot;The MAC will never be the same&quot;? Are they merging with the Big East? Wed, Oct 26, 2011 : 2:52 a.m. Finally seeing their seasons go in the right direction. Let's go Eagles! Wed, Oct 26, 2011 : 12:14 a.m.
Would love to see EMU start to win on a more regular basis! Go Eagles! Wed, Oct 26, 2011 : 12:11 a.m. If Ron English turns this program into a winner they ought to put up a statue of him. From coaches graveyard to savior.